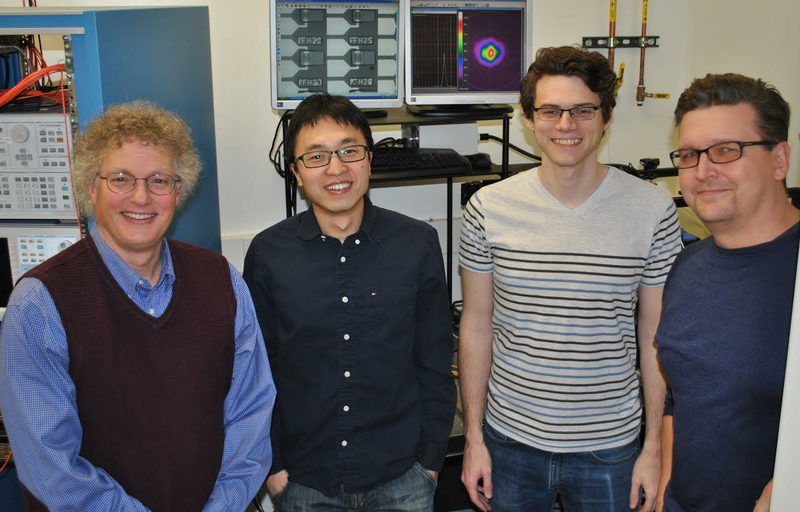 Abel Bliss Professor of Engineering Kent D Choquette's team of researchers recently applied new theoretical physics concepts to enhance the performance of a well-established semiconductor laser technology. In a paper published in Optica, the team reported parity-time (PT) symmetry breaking in an electrically injected, room temperature vertical-cavity surface-emitting laser (VCSEL) array for the first time. Left to right: Abel Bliss Professor of Engineering Kent Choquette, graduate students Zihe Gao and Brad Thompson, and ECE Professor Scott Carney. Parity-time symmetry is a physics law that describes quantum mechanical phenomena and it helps the University of Illinois researchers better understand how coherent VCSEL arrays operate. Other photonic researchers have predicted many other interesting phenomena related to parity-time symmetry such as unidirectional light propagation and side-mode suppression. Now that the Choquette group has demonstrated a viable VCSEL platform to showcase PT symmetry phenomena, the foundation has been set to explore significant advances in VSCEL technology, such as higher single-mode power, electronic beam steering, and faster data-transmission rates. ECE doctoral student Zihe Gao, the lead author of the research study, was inspired to apply the PT symmetry concepts to VCSEL technology after attending the IEEE Photonics Conference (IPC) in 2015. There, Gao learned that an analogy could be made between the optical paraxial wave equations and the quantum mechanical Schrodinger equation, which was attracting a lot of attention in the field. “While prior work demonstrated the physics, I realized that we may have the right technology platform to bring the physics to applications,” said doctoral student Gao, whose work has opened up a new field of interdisciplinary research. Until now, researchers had explored PT symmetry phenomena using either optically pumping or at cryogenic temperatures, neither of which are practical for real-world applications. Choquette’s team applied the PT symmetry theory to coherently coupled VSCEL arrays, which are microcavity semiconductor laser diodes that create coherently combined optical beams. By tuning the input currents to the VCSEL arrays, many parameters can be controlled, such as the beam steering direction, the intensity modulation rate, and the optical mode intensity distribution in the far field. Exploring the latter behavior was a focus for Gao, who realized that previously unknown far field patterns could actually be explained by making an analogy to the quantum mechanical phenomena of PT symmetry breaking. As Choquette’s team continues its research, Gao sees potential future applications through improved control of the optical modes as well as increasing the intensity modulation rate of the VCSEL arrays. Both of these aspects could significantly impact the performance of large data centers. Before this can happen, Gao intends to improve the consistency of present generation of VCSEL arrays. The Illinois team reported these findings in “Parity-time symmetry in coherently coupled vertical cavity laser arrays,” which was published in the January 30, 2017, issue of Optica. Other team members included ECE graduate student Bradley J Thompson, recent ECE graduate Stewart T.M. Fryslie, and ECE Professor P. Scott Carney. Their work was partially funded by the National Science Foundation. This story originally appeared in an article on the Micro and Nanotechnology Laboratory website.